IMCDb.org: 1974 Dodge Sportsman Winnebago Minnie Winnie [B-300] in "Used Cars, 1980"
That's a Dodge/Winnebago Class C mini motor home. Around 1974 or 1975, Winnebago started putting their own grilles on the Dodge B-300 vans they installed their camper bodies on. No, it's a 1976. I have one just like that. The "Gremlin" grille is one that Winnebago installed on its Minnie Winnies from 1973 to '76. It made the Dodge front look more like the "Class A" models (Brave, Indian, Chieftain). 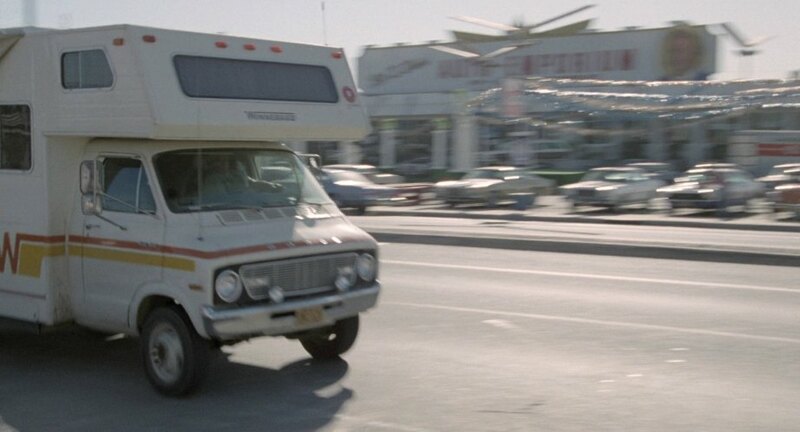 The 1977 model has identical markings but has the standard Dodge B-series van grille.